Located in the heart of Southeast Asia, Thailand has served as a trade and business hub for centuries. It was a buffer zone between colonial powers because of its strategic location. As a result, it was the region’s only nation that wasn’t colonized. Thailand (and its property market) is still able to reap the rewards from its strategic placement on the map today, yet in different ways. 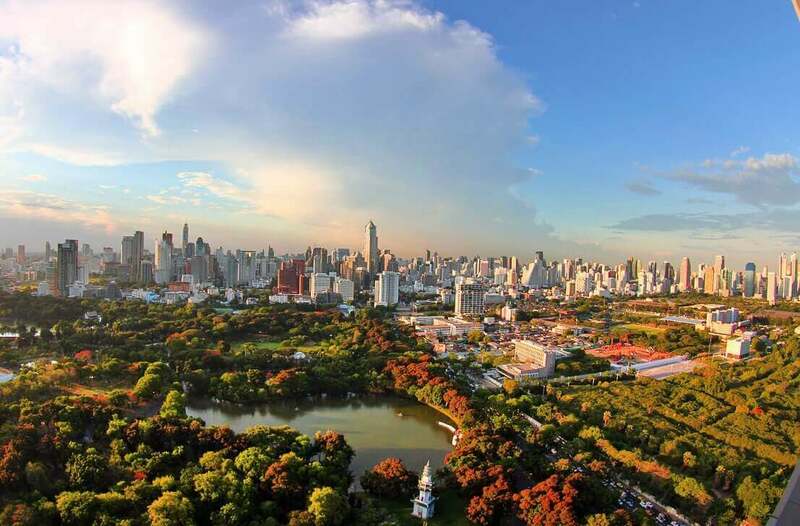 Its capital of Bangkok is just an hour-long flight from four rapidly growing frontier markets. Namely Vietnam, Cambodia, Laos, and Myanmar. These countries are among the world’s fastest growing and give Thailand easy access to cheap labor along with almost 200 million consumers – not to even mention its own decent-sized population of 67 million. Of course, the Thai economy isn’t just dependent on its neighbors for growth. You’ll find Thai exports in any supermarket in any Southeast Asian country. While stores in Thailand stock themselves with products from Japan and the US, stores in Asia’s frontier markets fill their shelves with Thai exports. Brands such as Red Bull (which as a little-known fact originates in Thailand) are sold globally as well. If you open up your computer and read the label on your hard drive, it’ll probably have a sticker which says “Made in Thailand” on it. This is because Thailand is one of the world’s top makers of hard drives and memory. Not only is Bangkok the most heavily tourist city on the planet (beating out Paris and London in Mastercard’s latest survey), but also one of the world’s largest exporters of automobiles, electronics, and hardware. Besides manufacturing and exports, Thailand has a large services sector considering it’s an emerging market. The Thai startup community is also seeing rapid growth and great success. These factors led to steady growth which has continued for about 30 years, transforming Thailand into one of Asia’s most dynamic countries. Naturally, this extends to the Thailand property market as well. A middle class which barely existed a few decades ago is now much more prominent. They’re capable of buying into the countless new condos and housing projects being built. 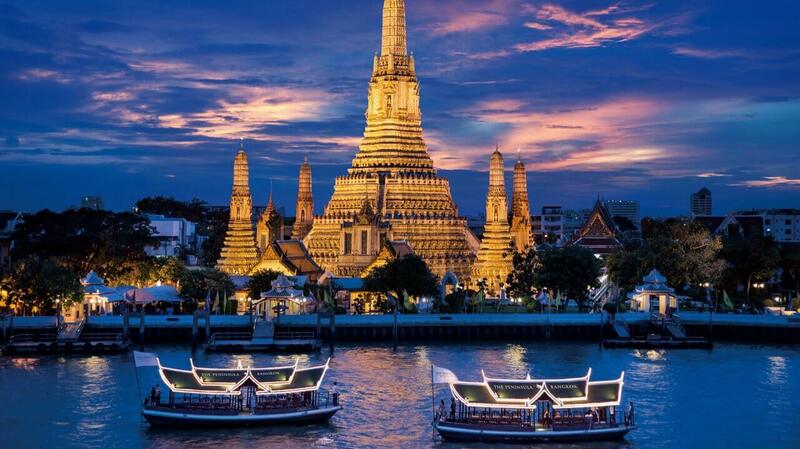 Thailand’s capital of Bangkok is the most visited city in the world with over 20 million tourists annually. Thailand’s real estate market is also one of Asia’s most popular among foreign investors. In fact, it might be the most popular. Buyers and renters from all over the world have become part of the housing sector whether they’re working as an expat, or are one of the many thousands of foreign retirees living in Thailand. Like everywhere else, Thailand has its share of problems. A military coup seized power in 2014 and an exact date for elections is still pending. Freedom of speech and freedom of press are not the greatest, to say the least, and its education system lags behind peers. But there are also many bright spots. The country is friendly towards foreign investment and almost anyone, even tourists, can open a bank account in less than 20 minutes. Thailand ranked 28th out of 190 different countries in the latest Ease of Doing Business ratings, gaining ground on competitors Singapore and Malaysia from last year. In addition, the country has a reputation of bouncing back from tough times. There’s even a name for it – “Teflon Thailand”. Over the past hundred years, 18 coups happened in Thailand along with many recessions. Yet things still ended up better here than in any of the five neighboring countries, except perhaps Malaysia. Thailand is undergoing some very severe changes under the current government and with a new king. If history is any guide, the country will perform well far into the future though. Can Foreigners Buy Thailand Real Estate? The business environment in Thailand is not quite as open as some other countries in Southeast Asia. Foreigners may only own up to 49% of a company… unless you’re an American citizen. Americans can own 100% of a firm under the Thailand-US Amity Treaty, making it one of the few situations where owning a foreign company as US citizen is actually helpful. With that said, even then the process is bureaucratic and requires approval from multiple government agencies. On the side of real estate ownership, foreigners can only own – at least easily – a condominium unit above the ground floor in a building where no more than 49% of all units. Technically, laws permit foreign ownership of land if you’re investing at least 30 million Thai Baht (about US$900,000 as of early 2018), but it needs special approval and there are not many cases known where this has actually happened. Some people will tell you that you can buy land in Thailand through a nominee structure. However, unlike in Cambodia, this is illegal and the Thai constitution specifically forbids this. The government has cracked down on Thai nominee structures in recent years. Many condo units are sold by the developer before or during the construction period. Buyers enjoy steep discounts by doing this, and the developer gets easier access to loans along with the ability to say that their project is “selling out”. It usually takes three to five years for a condo building to finish construction from the time sales first begin. Because of this, there’s a market in buying units off-plan, and selling them at a profit when the building is closer to being finished. You can sell and transfer the right to buy a condo unit once construction is finished. It’s not necessary to wait until construction finishes before offloading a property. Or at least its sales agreement. To reserve a unit and sign the contracts, you often only need to make a down payment of 10% along with another 10% gradually over the course of a few years. Installments are payable on a monthly basis. Over a period of several years, property values can appreciate significantly. There have been cases of people buying units off-plan and selling the contracts years before completion at premiums above 100%. But this also has its inherent risks. The worst-case scenario is that you must abandon the contract, lose your down payment and any installment payments. That could theoretically happen if, for example, property values fall or you don’t have money available to complete the transfer. How Much are Property Taxes in Thailand? Condominiums in Thailand have no annual property tax on them. With that said, any condominium will have a management fee for the building’s upkeep, electricity costs, staff and cleaning. It’s not a tax. Yet it’s still money that needs to be paid annually when owning real estate in Thailand. The cost of the management fee depends on the building’s size, density, and standards. It’s usually around 500 baht per square meter every year. When transferring property, there’s a 2% fee based on its government appraised value (which should be lower than the price you paid for it). Typically half of this fee is paid by the buyer and half by the seller. A stamp duty of 0.5% must also be paid upon transferring any real estate. Stamp duty is usually paid by the seller. However, if a property is sold within 5 years of being acquired then a “Specific Business Tax” of 3.3% is instead payable. If a specific business tax is payable, then stamp duty does not need to be paid. If you choose to rent out your property in Thailand, rental income taxes are extremely low as there are many deductions. Your exact amount of tax payable will depend on your deductions allowed. More often than not though, it’s not greater than 5% and sometimes far less. If you ask most local landlords, they’ll tell you they don’t calculate or pay the tax and no one ever bothers them. Is Buying Property in Thailand Safe? Thailand has rather strong property ownership laws (at least compared to most other places in the region) and a secure, computerized title system. So you shouldn’t have any issues with the government. If a problem is going to come up at all, it’s going to be from the condo development company or seller. There are about two dozen large property developers in Thailand with good reputations and many completed projects under their belts. You should have no major issues with developers of this type – at least not ones which they won’t try and fix. But you’re in a bit more dangerous territory if you’re dealing with smaller companies. A developer should have at least had a completed project or two built to good standards with satisfied customers. It’s highly recommended to get a third-party inspector once a unit is built and ready to be transferred to you. It’s rare for a condo unit to be transferred in perfect condition with no problems at all. Thai inspectors will know what to look for and can add value worth far more than what you’ll pay. If the inspector finds defects, the condo developer will fix them free-of-charge. Almost all condo developers give a warranty period of at least a year or two. Yet they’re more eager to fix problems if you bring them up before the transfer period when money is still on the table. Thailand is a rather large nation of almost 70 million people and as such, there are numerous cities, towns and resort destinations to invest in. Keeping in mind that foreigners may only own condo units which leaves out smaller towns and villages for property buyers. However, you still have many options elsewhere. Bangkok, a city of over 16 million people, is the capital of Thailand and the largest city in Indochina. If anything happens of any business, economic, or political importance, it goes through Bangkok. Chiang Mai, Thailand’s second largest city, is also not a bad place to buy real estate. But while a lot of foreigners are scooping up condos in resort areas like Pattaya and Phuket, it might be worth avoiding tourist destinations for reasons discussed further below. The ever-expanding skyline of Bangkok. 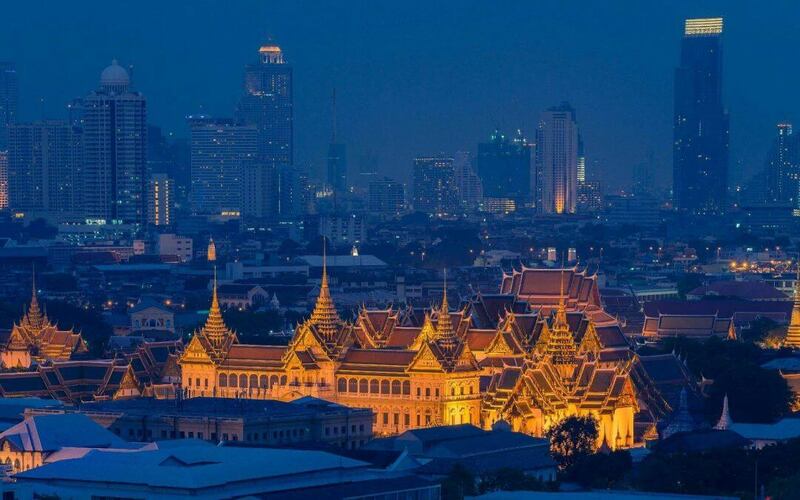 For centuries, Bangkok has served as a main entry point for foreign traders and businessmen into Southeast Asia. While the city has obviously changed since the 1700s, its status today as one of Asia’s more important cities is no different. The city is so large that many of its neighborhoods have their own “sub-markets”, each with their own norms, occupancy rates, prices and outlook. Centrality and access matter a lot. So buying a property in Bangkok’s suburb of Bangna is completely different than buying one in the prime-city center area of Lumpini. It’s not practical to cover every one of Bangkok’s neighborhoods in a single post. So only a select few areas will be discussed. With that said, general rules exist for buying property in Bangkok. Real estate which is located closer to a BTS Skytrain station will be worth a premium as high as double or triple over a similar property which isn’t. Condominiums located close to the MRT subway line also go for premiums, albeit not as much. A condo located 100 meters from a central mass transit station is unlikely to be sold for less than 200,000 baht per square meter. When a building is located 500 meters away, the premium is reduced by as much as half. It vanishes altogether for a property more than a kilometer away. As Bangkok’s most exclusive area, Lumpini Park and its surrounding streets (Wireless Road, Soi Langsuan, etc.) are also some of the most expensive neighborhoods of the city. New property developments on Wireless Road, for example, have been known to reach prices as high as 500,000 baht per square meter. The reason for these high prices is that Lumpini is incredibly central, yet also rather quiet and leafy. Streets are manicured while Lumpini Park – inner Bangkok’s largest green area – adds a sense of calm hard to find elsewhere in the CBD. Wireless Road’s embassies help make the neighborhood safe, less noisy, and spacious too. The American, Vietnamese, and British embassies among others are all nearby. Lumpini is between several prime areas despite this. Namely, the business districts of Silom and Sathorn, the commercial center of Siam, and the many dining options of Sukhumvit. Needless to say, a BTS station is never hard to find. 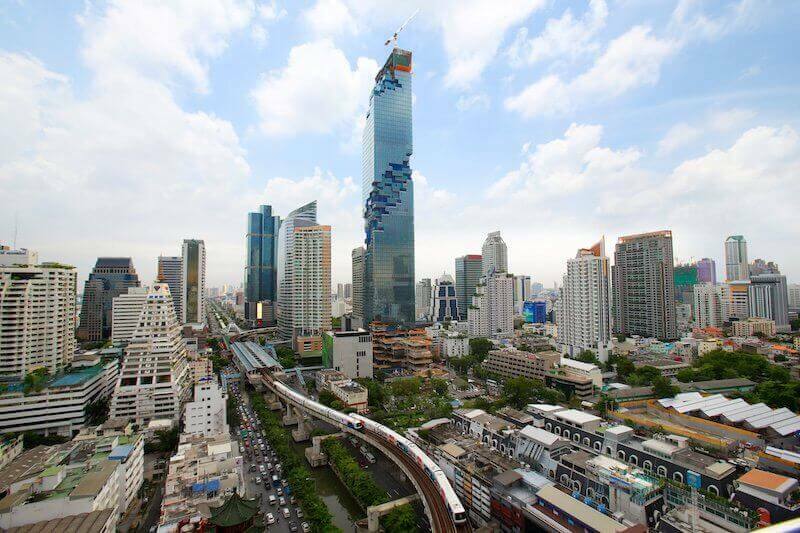 Mahanakorn, the tallest building in Thailand, is located in Silom. The Silom and Sathorn districts are where most of Bangkok’s financial institutions and multinational companies are based. As such, the areas are popular with both wealthy locals and expats who work in Bangkok. Since it’s Bangkok’s central business district, prices are obviously high. Those who live in Silom and Sathorn also enjoy easy access to the rest of the city center though. A variety of international restaurants and other amenities are always within walking distance. Sukhumvit is one of the longest roads in the world. It not only extends from Bangkok’s core to its outer suburbs, but eventually goes all the way to the Cambodian border. However, Sukhumvit is more well-known for its portion which lies in downtown Bangkok. Specifically from Nana up to Soi Ekkamai and its BTS station. This strip of Sukhumvit is Bangkok’s most popular expat area. Countless international restaurants serving everything from Argentinian to Japanese food help Thonglor, Asok, and Ekkamai’s “hi-so” reputation. Moving southeast along Sukhumvit towards On Nut, the Thai neighborhoods become much more local. You can buy a condo in these areas for under half the price of those in Sukhumvit’s “downtown” section. With that said, suburban Bangkok is now experiencing an oversupply of one-bedroom units. You’ll do better buying large units downtown. 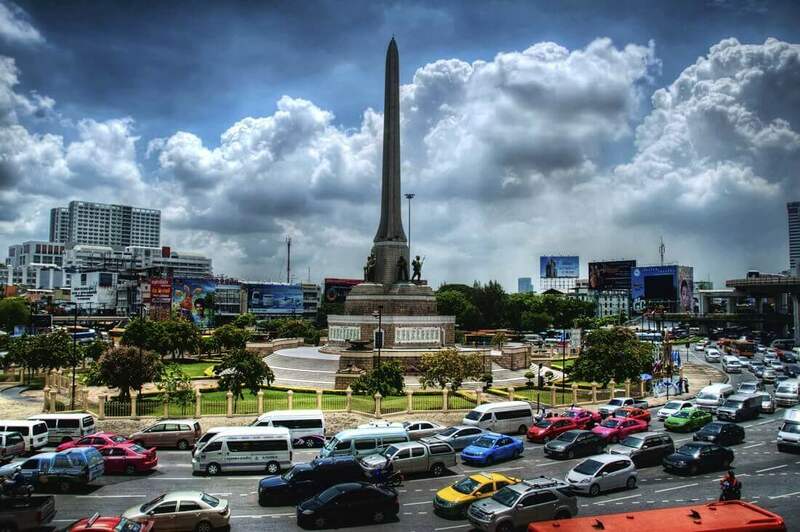 Victory Monument is Bangkok’s transportation hub and center-most point. Ratchathewi is arguably Bangkok’s most central district. They have three different BTS stations going through the neighborhood along with an airport rail link. Furthermore, Ratchathewi district is directly north of the Bangkok’s commercial hub of Siam. It’s also directly west of Thailand’s political center of Dusit. Despite these factors, prices here are lower than in other core locations. Occupancy rates in Ratchathewi are some of the city’s highest too. The feel of Ratchathewi is a lot more local and you won’t find as many expats as you would in Sukhumvit or Silom. Yet the area is near government offices like the United Nations and is just a stone’s throw from elsewhere in central Bangkok. Victory Monument and the nearby Soi Rangnam in particular is Ratchathewi’s most desirable residential area. The King Power Complex, Bangkok’s largest duty free mall, is on the street along with lots of restaurants and stores. Some foreigners, retirees and second home owners in particular, choose to live on Bangkok’s Chao Phraya River. Scenic views can be enjoyed from luxury condo units along the riverside. Generally, the west side of the Chao Phraya has lower prices. That’s because of easier access to Bangkok’s central business district (CBD) from the east side. Residents on the river’s west side also must either drive across a crowded bridge or take a boat in order to get to Bangkok’s city center. Bangkok’s river has malls, hotel branded residences, and some of the city’s soon-to-be tallest buildings being built on it right now. However, occupancy rates along the riverside are already low even without them. In the meantime, both the public and private sector are rejuvenating the area with countless developments of all types. Time will tell whether they can bring the river back to life. Chiang Mai is Thailand’s second largest city, yet it’s significantly smaller than Bangkok with just around 2 million people. As such, the sheer variety of condo projects like you would find in Bangkok (remember: foreigners can only own condos in Thailand) don’t exist. Most local buyers in Chiang Mai tend to live in houses or other low rise structures. Nonetheless, Chiang Mai is one of Asia’s most popular small cities for retirees, entrepreneurs, and digital nomads in particular. Even though you’re unlikely to have tenants working for multinational companies. The Chiang Mai property market is arguably better for Airbnb and short term rentals than Bangkok. If you’re willing to put some work in and don’t mind being in the accommodation industry, it could prove fruitful here. Our guides usually don’t include destinations that we don’t recommend investing in. However, so many foreign buyers choose condominiums in Pattaya and Phuket that it’s worth addressing why not to buy in these two cities – at least not for the purpose of investment. People oftentimes come to Thailand as tourists, visit Pattaya and Phuket (among other places), and decide to buy a condo in one of these two cities. There’s nothing wrong with buying real estate in Thailand most popular beach areas if you want to live here. Don’t be mistaken though: Pattaya real estate isn’t a very good investment. You might not lose money – although that’s a distinct possibility as well. It’s simply that tourist areas are too subject to “flavor of the month”. Southeast Asia has plenty of beaches. The sole factor distinguishing Pattaya from Kui Buri (a quiet beach 50km south of Hua Hin) is where people chose to live and vacation. Pattaya/Phuket have off-seasons and are plagued by low-occupancy rates. They lack the staying power of Bangkok which has multinational companies and a steady flow of well-paid expats. Again, there’s nothing wrong with buying a place in Phuket or Pattaya if you only want to live here. But the primary purpose of an investment is to make the most money possible with the least risk. Doing otherwise is a huge mistake. If a wealthy Thai in Bangkok has a weekend home, it’s most likely in Hua Hin. With everything said about Pattaya and Phuket above, most of them don’t apply to Hua Hin. You’re probably wondering why. Hua Hin is much less built up than other Thai resort cities. It will probably stay that way due to the nearby Royal Palace. Most importantly, it’s also a lot better fed by local demand. Take it from someone who got his business degree at Thailand’s top university and speaks Thai: the wealthy locals (there are more than you might think) love having weekend homes in Hua Hin. Yet the locals are less likely to vacation in Phuket which is too far away, or Pattaya which is too rambunctious. Quite simply, if the Chinese and Russians stopped vacationing in Pattaya its property market would die. 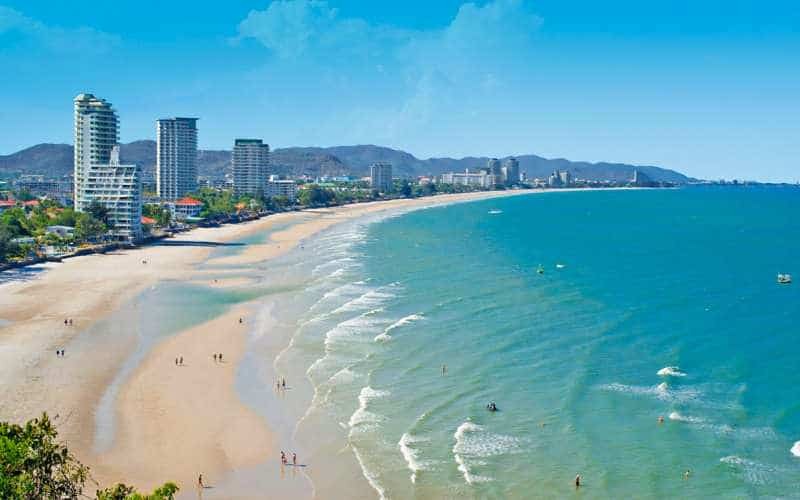 Hua Hin boasts a sustainability and growth that other beach areas in Thailand do not. Locals don’t really use real estate agents in Thailand. Instead, they either buy from property developers directly or find resale units through mutual friends or online forums. For the most part, real estate agents who sell Thailand property are a “western service”. They exist to take a commission while making things easier for foreign buyers who don’t speak Thai. That’s fine if you’re new to the market and truly need help. Just keep in mind that if you’re an investor, you’re immediately losing a few percentage points of profit by using realtors. Use a lawyer – not a realtor – if you need help with the transfer process. Pay him a fixed fee. If you’re buying directly from a condo developer, there’s no reason to find a realtor or lawyer if the company is reputable (specifically, if it’s listed on the Stock Exchange of Thailand). Remember: it’s their job to sell you a condo unit in a country where realtors aren’t really used outside of major transactions. So they’ll take care of the transfer process and everything for you. It’s possible to get a one-year investment visa, renewable indefinitely, by investing at least 10 million baht in property. You can also qualify though buying stocks in Thailand, bonds, mutual funds, or a combination of any of these assets. In fact, this is something I’ve done myself. 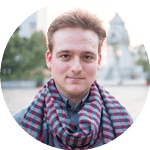 I use Bangkok as a base in order to travel to different frontier markets such as Cambodia, Vietnam, and Myanmar. So I have a condominium in Thailand, along with an investment visa. With that said, it’s not the best program in the region. Malaysia’s MM2H program is less expensive, easier, and comes with more benefits. Meanwhile, you can live in Cambodia indefinitely for around $300 per year. However, I didn’t go through the program solely for investment reasons. I bought Thai property because I enjoy living here. It serves as a convenient base considering what I do for a living. Is Buying Thailand Real Estate a Good Investment? Thailand’s strategic location puts it an hour’s flight from four different frontier markets – Cambodia, Laos, Vietnam and Myanmar. It not only makes Thailand a great base for the region, but lets the economy itself to benefit from “piggybacking” on its less developed, faster-growing neighbors. Property in Thailand might not have the best prospects in Asia (we believe that title belongs to Cambodia). With that said, the market has proven very resilient over the past ten years or so. Thailand’s Baht has been one of Asia’s most stable currencies, fluctuating less than even the Singapore Dollar or Japanese Yen over the past decade. Real estate in Thailand, along with the nation’s currency and economy, has a rather low tendency to crash in a recession. That makes it ideal for certain types of investors. Thailand property values held their ground throughout the 2008 Financial Crisis. Since the coup in 2013, they’ve even doubled in certain areas of downtown Bangkok like Ratchathewi and Thong Lor. Interesting times are ahead for Thailand. Yet the nation’s economy has always been able to bounce back and reinvent itself. This was true even during times much more uncertain than now.